Here's how I make my little pictures...I use very stiff watercolor paper, then with my finger I spread on a layer Goldens Ground Absorbent. I dry it with a hair dryer. Then I use acrylic to paint the rose. Next, I add layers of watercolor to the background, dabbing it with a paper towel. It is so much fun, you need to give it a try! I used Goldens gloss med. on top after spraying it with fixitive. I added a bit of vintage lace and the bow is a working pin, I just pinned it on. I'll be selling these on Etsy or my Ebay...Have a great Saturday!! Tiny baby shoe with nest and roses...I'm adding this to my EBAY. See the cute little basket with a rose charm. Another batch done (can you call 3 a batch? ?lol) I'm improving on my metal stamping. yea!! Now if I can improve on my photography! I did another nest. I dipped it in a patina solution, its a little darker then it appears here. Now this is what I'm talking about!! I've had suggestions for placecards...this one I LOVE! I found I had some white stained glass...it could probably be called vintage...its from the "back in the day" when I made stained glass windows. I pulled out my glass grinder. dusted it off, added water and purrrrrr. Still worked like a charm! Then I wrapped it in very narrow foil and soldered away... Oh yes, a dry erase pen works!! I'm a little slow getting these out...my day job is taking up waaaay to much time!! I had to clean and paint 3 Townhomes. With the economy changing, I had 7 people give notice that they were buying homes...good for them...bad for me. I'm lovin these spoon easels!! 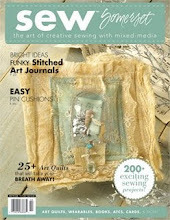 ***************************SOLD**********************Is it ok to love making things soooo much??? lol. First....I want to thank you all for such nice comments! Then I want to thank all of you that purchased all the ones I made!! It got me so excited I made 3 more! 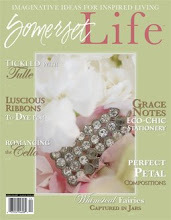 Oh, I got the most wonderful message from Jenny Doh of Somerset Life, she is going to put them in her magazine!!! ***************SOLD*************This one...get it, Bird...nest. I wired on a little heart charm. If you purchased my spoons, I got them all mailed out today. Thank you ,Thank you, to everyone for leaving me such nice comments about the spoon easels. The forks have such a long handle and most of the design is on the tip, it leaves a perfect place for a snippet of lace, old buttons and a pearl. I really like the texture on hard watercolor paper that the Ground Absorbent did, I tried it again, I also like the background being watercolor and doing the rose in fluid acrylics. This one I varnished. I knew there were these things called inchies, so I googled it. They are little pieces of art work done on one inch squares. But I also notice there was no way to display them without mounting them onto something bigger. I stamped BIRD with my metal stamps. These spoons are perfect! I'll be getting some forks out soon. This was a fun painting. I have a little bit of beautiful French watercolor paper left, I smeared it with Goldens Absorbant Ground then painted with acrylic and watercolor. I love all the texture. Can I change my mind??? How much fun can one gal have in a day??? So I have a vintage small vice that I love to use for bending things, I started by putting a spoon in....bend, move it a bit....bend....Oh MY!!! It WoRkEd!!!! Think on this one I added a "snow flake" piece of vintage jewelry! I'm really excited!!! I think I'm onto something!! Ok, I forgot to talk about the "pictures" The top one I painted my nest...then used metal stamps and stamped "Bird" How fun is that??? Then I painted this little snowman on one side and the tree on the other. I made little snowflakes with glue and and added glitter! Today was our anniversary. This is what I was brought this morning...the last of our roses, he actually went out and cut them, put them in a vase for me. Yellow roses are my favorite...and it means more to me that he did that, then to go out and purchase some. We went to our favorite restaurant Macaroni Grill sooooo good. Now that I'm done and I'm looking at my pictures and realise you cant see the spoon and how neat it is, I'll show you that tomorrow. And it all came together...would anyone like this??? I'm giving it away...Yup, the fork easel and the charm. I forgot to paint the other side, so its blank. You could add a "rub on" on the back side. Anyway...You all have been sooooo nice and wonderful!! So, answer this question, what is your favorite TV program. I'll pick a winner over the weekend sometime. Diane is hav ing a giveaway. If you haven't been over there yet...she does the most beautiful work!! 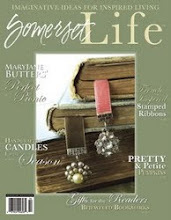 There is a beautiful Giveaway going on over at Kathy's Katcollects...Lots of Pink lovelies. Another one that I finished yesterday, This one will be on Etsy too. A shoe in the "works"
I aged and crackle the baby shoe then painted a little rose on both sides, that match the color of the birdie. I also aged the ribbon. I really like how it turned out. I just put it on Etsy. I'm trying to get ahead...Lollishop is opening in Nov. Christmas is going to be here before we know it. I try to have one birdie on Ebay and one on Etsy... I want to take a couple of things off Etsy and rework them, but I need more TIME. Today was my day off...to me that means I don't have to cook, answer the phones, do any cleaning...heaven!!! So I set aside today as Laurie's Craft Day"
I had a bunch of birdies made, but no home..so I laid out all my birds and things I had "in the works" and matched them up...I got 7 finished. That's a lot..I painted flowers, added lace and flowers and glittered pins, sprayed ribbon with Glimmer Mist, now I'm pooped and my back aches. lol, its a "good" back ache. Aaaauck, I only have 2 orange pieces left. This beautiful carnival dish and then a cup.